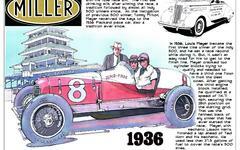 This is David Story's second rendering of 1928 Indianapolis 500 winner Louis Meyer. Meyer became the first three-time champion of the legendary contest, with other victories in 1933 and 1936. As an aside, he is known as the first driver to drink milk in victory lane. In Meyer's case, his swig was not part of an American Dairy Association promotion, but instead a matter of personal preference. Also, it was buttermilk. You can find David's first artwork for the 1928 race elsewhere on First Super Speedway. "Rookie driver Louis Meyer did not even have a ride until one week before the race. Alden Sampson purchased the car four days before the time trials were to begin. Sampson hired Meyer to drive his car. It was the same car Tony Gulotta drove to a 3rd place finish in the 1927 race. Meyer qualified the Miller in 13th place. Leon Duray dominated the early stages of the race, but he dropped out on the 133rd lap with engine overheating problems. The final 100 miles was a 3 car battle between Jimmy Gleason, Tony Gulotta and the steady but gaining Louis Meyer. With 20 laps to go, the three were only separated by 2 seconds. Gulotta's car stalled in turn 3, Gleason headed to the pits for water, which allowed Meyer to move into the lead on lap 182. Tony Gulotta looked like a sure winner with less than 19 laps to go. But his car stalled with a clogged fuel line and was forced into the pits. It took his mechanics over an hour to make the necessary repairs. Gulotta returned to the race finishing a disappointing seventh. 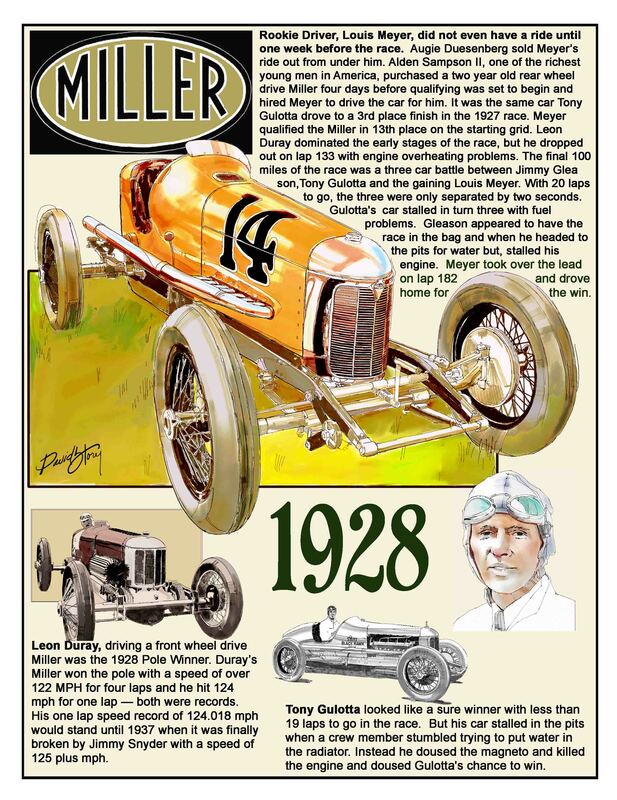 Leon Duray was the 1928 pole winner driving a front wheel drive Miller. He set a speed record that would last until 1937 when it was broken by Jimmy Snyder. Duray's speed was 124.018."